Tuition hikes have become commonplace across campuses of public universities in Kansas. “They keep beating inflation by a long way and that’s not appropriate,” Gonzalez said. 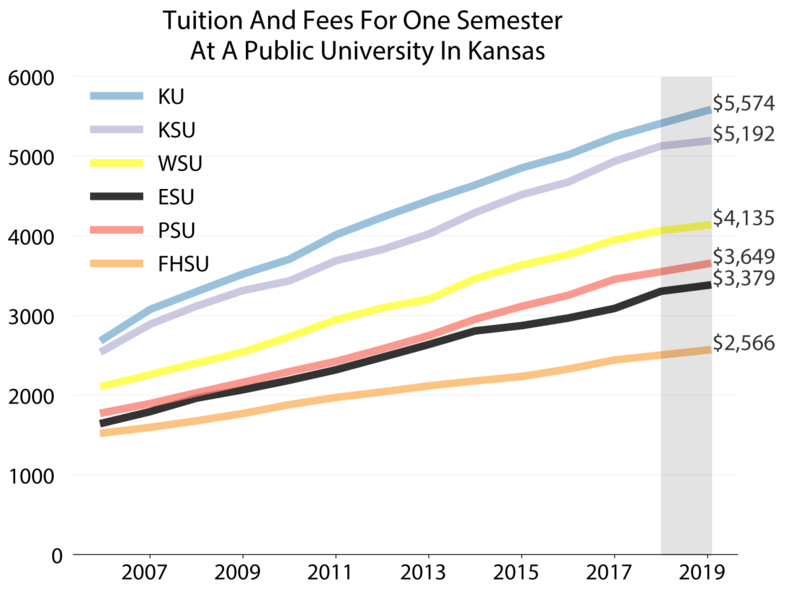 Kansas State University had the smallest proportional increase with a 1.2 percent tuition-and-fees hike. In its proposal, K-State said the increase is its smallest request since 1989. (Fort Hays State University had the smallest raw increase at $61.95 per semester). K-State credits the recent restoration of $15 million in higher education funding from the state for keeping the increase lower than it would have been otherwise. “We made a very intentional effort this year to say if we get money back from the state we’re going to do everything we can to keep tuition down,” said Jeff Morris, vice president of communications at K-State. But that restoration failed to fully restore the $30 million in cuts enacted statewide in 2016. Other universities had larger tuition percentage increases. Wichita State University, for instance, had a 2.2 percent increase. Wichita State said it is using some of the restored funds for scholarships, while the tuition increase is being used to cover rising costs, such as healthcare and utilities. “None of us like increases, but there are some overall expenses that are always going to be a part of doing business at the university,” said Rick Muma, the provost at Wichita State. Without the increases, Muma said, the university would have to make hard choices, such as cuts to student services. Meanwhile, new services have struggled to get started under the university’s current budget restrictions. Wichita State has planned on hiring “student success coaches” to proactively reach out to struggling students, but hiring for the program has been on hold for at least four years because of budget constraints. A growing portion of university budgets are being covered by tuition. Before 2008, tuition revenue covered less than half of the educational costs at Kansas’ public universities. In 2017, tuition accounted for more than 70 percent. “If our enrollment were to increase, that would help offset any type of tuition increase we would need,” said Howard Smith, the associate vice president of enrollment management at Pittsburg State University. Yet Kansas universities have been struggling to draw more students. 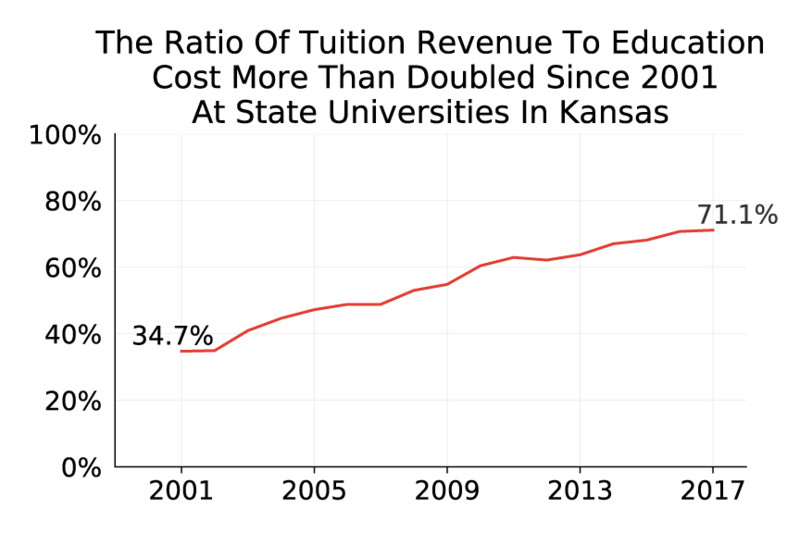 Enrollment has mostly stayed flat in recent years. Smith attributes that partly to increased competition. Flat enrollment numbers are more than a revenue issue. Increasing enrollment is seen as a way to stave off workforce shortages. The Kansas Board of Regents’ strategic plan, Foresight 2020, aims to increase the number of adults in Kansas with a post-secondary degree to avoid such shortages. Kansas public universities have fallen short of the plan’s targets, however, and some of those shortages are already impacting the state. Tuition may also function as a deterrent. While Flanders said that tuition increases are necessary to maintain quality without an increase in state funding, any hike raises the concern of restricting access to higher education. Stephan Bisaha reports on education for KMUW in Wichita and the Kansas News Service, a collaboration of KMUW, Kansas Public Radio, KCUR and High Plains Public Radio covering health, education and politics. Follow him on @SteveBisaha. Kansas News Service stories and photos may be republished at no cost with proper attribution and a link back to the original post. The cost of higher education in Kansas continued to swell this week, carrying on a long-running trend in which universities rely increasingly on tuition and fees to operate.